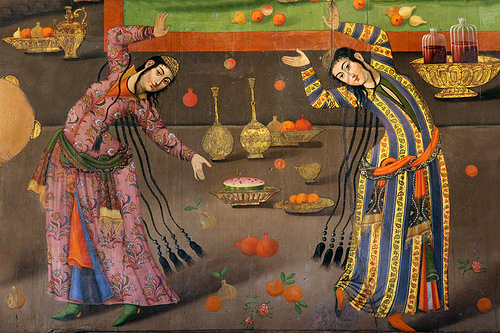 The concept of feasting was pretty much invented in the Middle East by the courts of Shah Abbas and those opulent Ottoman dudes. If you combine this fact with the idea of meze – the relaxed sharing of multiple dishes, and our also speciality – it is in fact quite astonishing that we haven’t done any seasonal banquets up to now. We will be offering four dates at the Cinnamon Tree Bakery over the Christmas period, although we will happily consider other catering enquiries and private parties. The price for each of these of these menus is £40 a head, and includes Christmas fripperies, cheesy Christmas music, a complimentary glass of Persepolitan Pimped Prosecco on arrival and Mr. Shopkeeper’s best Santa impression. A £10 a head deposit will secure your reservation. Events start at 7.30pm. Call 020 7639 8007 to book – or pop in to the shop. Vegans are very welcome, but please advise us in advance so that we can cater for you magnificently rather than adequately. *Please note that if any of these dates are under-subscribed, we may need to move your booking to a different day or offer you a refund. Fingers crossed that they will all sell out really quickly and you’ll be clamouring for more. ALSO: the menus are subject to (minor) change according to seasonal availability and other relevant stuff.